As soon as you know it, the end of the year is almost here, with it bringing Christmas holidays and New Years. I loved last year’s holiday season, I had a bit of time off and ate lots of great food with my family. I never got around to posting the huge amounts of food we ate, although you might remember I did post about the chocolate swirl croquembouche. 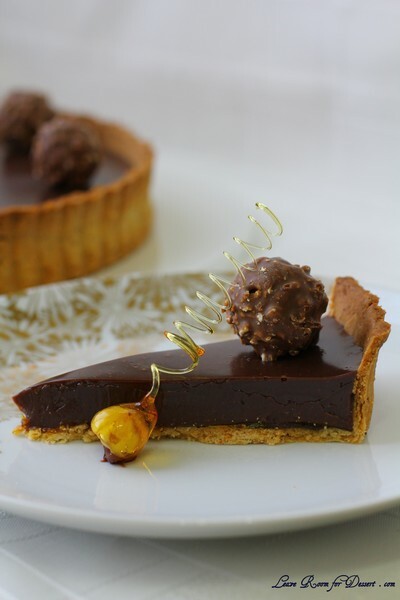 There aren’t too many things that work quite as well as chocolate and hazelnut, which inspired along with Ferrero products to make this chocolate and hazelnut tart. Ferrero have just launched a new website, Ferrero Boutique, which showcases their different hampers available in time for Christmas. 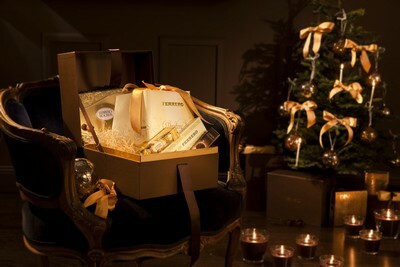 One of interest is the Ferrero Gourmet Christmas Hamper by Tobie Puttock, which includes Ferrero Panettone & Torrone, Ferrero Rondnoir and Rochers. Tobie uses the Panettone in his recipe: Grilled Peaches with Caramelised Panettone recipe from his latest cookbook, Cook Like An Italian and is also available on the Ferrero Boutique site. This hamper along with the others on the website are limited in number though, with 500 originally being available, although this number has already decreased. $5 from each hamper also will be donated to OzHarvest, which exists to rescue excess food which would otherwise be discarded, and distribute it to charities supporting the vulnerable in Australia. What is your favourite Christmas recipe and/or how do you celebrate the holiday season? 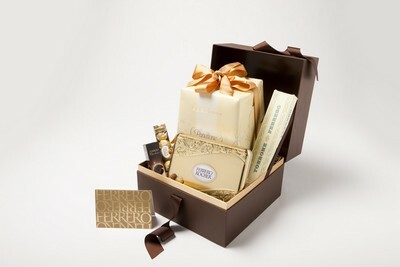 Ferrero will choose the most creative responses from all three sites, to give a hamper to. The competition finishes on Friday 10th December 2010 at 5pm. Winners will be notified by email. Please see here for Terms and Conditions. For the pastry, process the flour, hazelnut meal and icing sugar in a food processor. Add the butter and process until the mixture resembles fine breadcrumbs. Add the egg yolk and process until just combined. If it is not coming together, add a teaspoon of egg white or cold water at a time until it is just combined. Tip out onto a lightly floured surface and shape into a disk. Cover the disk and refrigerate for at least 1 hour. 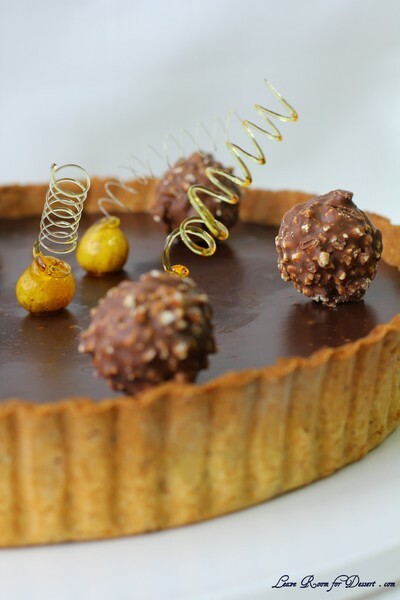 Roll out the pastry to 3mm, or enough to line a 22-25cm (diameter) round fluted tart tin. Line the tin with the pastry, making sure to press the pastry into the sides. Remove excess by rolling a rolling pin over the top of the tin, or by hand – smoothing any edges if needed. Refrigerate for 1 hour. For the toffee layer, place the sugar in a small saucepan and place on high (or medium high). Once the sugar starts to caramelise on the outer edges, slowly mix in small amounts of the unmelted sugar, until it is all caramelised. Pour onto a sheet of baking paper. Once cooled, process in a small food processor. Place a sheet of baking paper over the pastry lined tart and fill with pastry weights or uncooked rice. Place in the oven for 10 minutes, then remove the weights and baking paper and return the tart shell to the oven and cook for approximately 5 minutes until the bottom of the tart has started to brown. Place the processed toffee over the bottom of the tart shell and place back in the oven for 3 minutes or until the toffee has melted into a even layer. Remove from the oven and allow to cool. For the filling. Place the Nutella and chopped chocolates into a large bowl. Heat the cream in a small saucepan until it just starts to bubble. Pour the cream over the chocolate and Nutella and stir gently until it forms a smooth mixture. Pour the mixture into the tart shell. If there are some bubbles present, you can carefully use a creme brulee torch to remove them. Refrigerate overnight. The hazelnut corkscrews need to be made as close to serving as possible. To make these, roast the hazelnuts in a 180C oven for 5-10 minutes, until they are roasted and the skins start to come off. Remove from oven and place onto a clean tea towel. Rub the hazelnuts through the towel to remove the brown skins. Place a tooth pick into the base of each hazelnut. Heat the sugar and water in a very small saucepan over low heat, stirring until the sugar is dissolved. (I used a 10-15cm based saucepan, if you are using a larger one, you may need to increase your toffee ingredients to allow for a higher toffee level to allow easier dipping of the hazelnuts). Once the sugar is dissolved, place the mixture on high and cook, without stirring until the toffee turns a caramel colour. Place the bottom half of the saucepan into a sink filled with cold or tap water – this will stop the toffee from becoming too dark. Mix the toffee with a spoon and test the consistency of the toffee by trying to slowly spin the toffee around a clean knife steel. (Hold the steel in your left hand and rotate the spoon with toffee clockwise around the steel until a corkscrew is made). 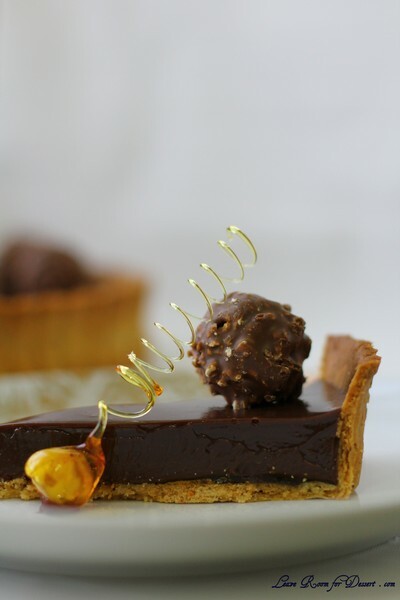 Once it is at the right consistency, dip a hazelnut into toffee and make a corkscrew at the end of it. It is easiest if you can get someone to help you with this, as they can remove the corkscrew while you hold the hazelnut (as the toffee on the hazelnut doesn’t solidify as quickly as the thin corkscrew). If you don’t have a second pair of hands, place the hazelnut onto a piece of baking paper and slowly remove the corkscrew from the steel. 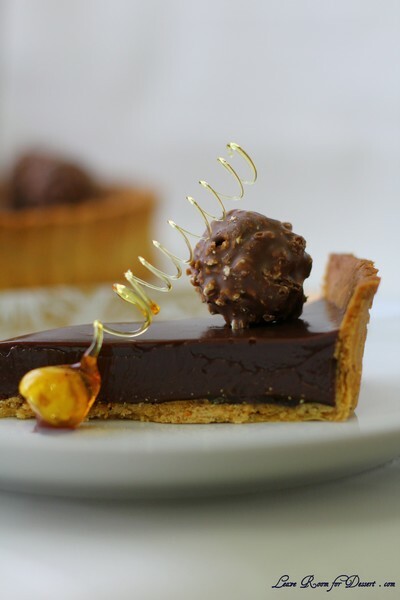 Place the Ferrero Rochers and caramel hazelnuts over the tart and serve with vanilla ice cream. Filed under Cakes, Slices and Biscuits, Competitions, Dessert, Nuffnang, Recipes. You can follow any responses to this entry through the RSS 2.0 feed. You can leave a response, or trackback from your own site. Wow, what a beautiful looking tart!!!!! That would be a nice dessert for Christmas!! Hope you have a great Christmas and a fabulous New Year and please keep the recipes coming!! Oh my, that toffee spiral is one of the most exquisite things I’ve ever seen! Hmmm, looks yummy and quite easy to do. This one will definately be on the table on Christmas Day! Perfect dessert for the festive season, your cake presentation is very exquisite! Anita, great looking tart. You are a master of pastry! Wow Anita is looks so yummy!! The major celebration occurs on the Eve of Christmas. My family attends Christmas Eve mass together and then gather for a grand family dinner which we call, Noche Buena. In this festive season, we always adorn our windows with “Parol”, Christmas lantern influenced by the Mexican Pinata. Christmas is never complete without the Christmas tree filled with decorative pieces and colourful lights! On Christmas eve, my family members partake a sumptuous meal by twelve midnight, called Noche Buena. This usually comes after we attended a late evening mass or church service. My favourite Christmas recipes are “Bibingka”, Filipinos rice cakes made from rice flour topped with carabao cheese and grated coconut and “Puto Bumbong”, purple glutinous rice cakes steamed in bamboo cylinders and sprinkled with grated coconut and brown sugar. Christmas shopping is an interesting part of the festive season. I love buying presents for my love ones and I could spend entire days christmas shopping. I also like to make handmade chocolate truffle and shortbread biscuits which I’ll keep in a tin for several weeks before and after Christmas. My ideal Christmas meal: prawns on the barbie, cold beer (wheat beer type Hoegardeen), tomato/mozzarela salad, proschiuto and rock melon, pavlova and Ferrero rocher!